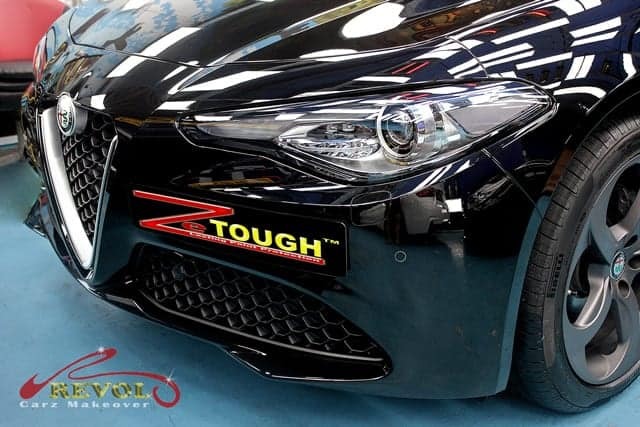 A stunning compact Alfa Romeo Giulia Super garnered admiring looks after it has been pampered with ZeTough Ceramic Paint Protection Coating treatment at Revol Carz Makeover. The hype around the Alfa Romeo Giulia has been piquing much attention with its surfeit sporty appeal and good, if not best-in-its-class build quality. The interior delights with opulent cabin trims and premium finishes with touches of brushed aluminum on the dash and dark wood grains. The leathers are sumptuous, high quality cow-hide dubbed Pieno Fiore. An 8.8-inch infotainment system connects via Bluetooth and USB. Keyless auto-entry with push-button start comes as standards. 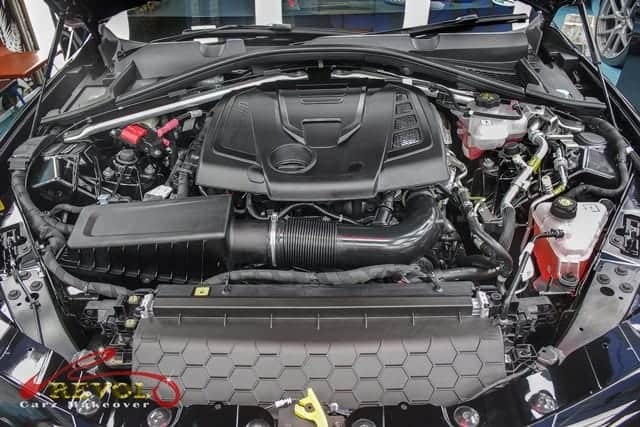 Under the bonnet, the Guilia Super is beefed up by a 2.0-litre four-cylinder turbo- petrol engine tuned to produce 147kW of power and 330Nm of torque and pairing exclusively with a responsive ZF 8-speed automatic transmission. Acceleration from standstill to 100 km/h is claimed at lightning 6.6 seconds. 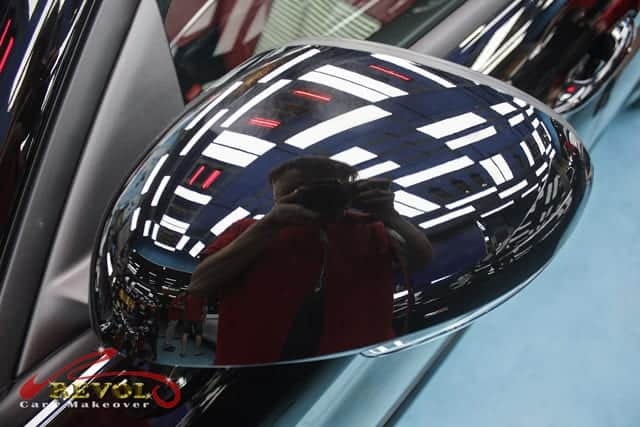 If you’re wondering how we managed to produce such a staggering deep mirror-shine on the Giulia, just hop in and let us take you on a virtual tour to our Revol Carz Makeover studio to see the incredible transition. The triumphant Alfa Romeo Giulia Super boasts jaw-dropping shine after grooming at Revol Carz Makeover. The ZeTough Ceramic Paint Protection Coating makes the Giulia passionate with longer-lasting shine. The gleaming sleek yet muscular exterior catches the eye with a long bonnet swooping down to the iconic shield-shaped grille with offset number plate. The manually polished Bi-xenon headlight clusters deliver an impressive package. 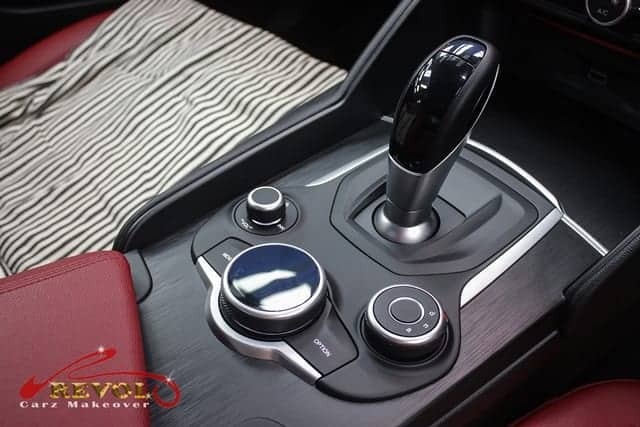 The super-clean sporty interior delights with opulent cabin trims and premium finishes with touches of brushed aluminum on the dash and dark wood grains. The leathers are sumptuous, high quality cow-hide dubbed Pieno Fiore. The interior is in line with the Alfa Romeo ethos with the slopping dashboard shaped to towards the driver. Our detailers ensure that every inch is carefully cleaned and polished. The central console features grained wood which surrounds the gear lever, infotainment controller and dynamic selector dial. The exterior mirrors shine like a dream with ZeTough Ceramic Paint Protection Coating. 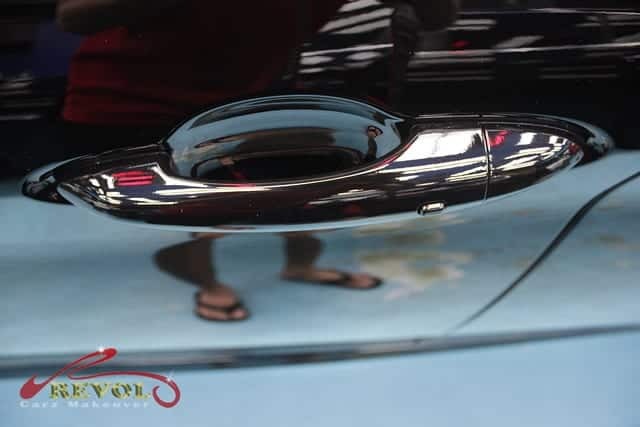 With ZeTough Ceramic Coating, the hard diamond-like surface prevents finger nail scratches around the door handles. The rear perspective is beautifully detailed, with graceful gem-like taillights wrapping around the haunches and a tasteful lower valance with dual exhaust tips. 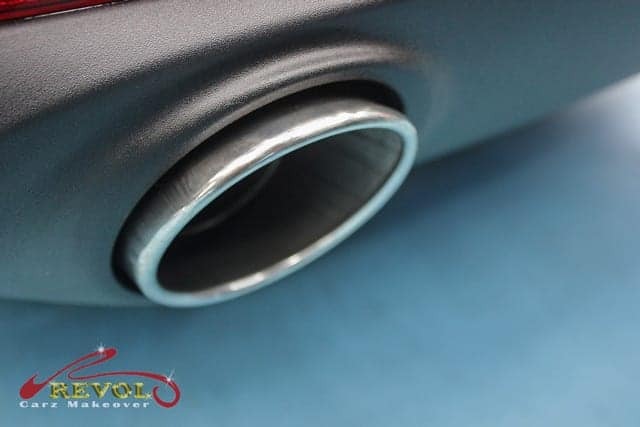 The dual-exhaust tips are manually cleaned and polished to look perfect and brand new. 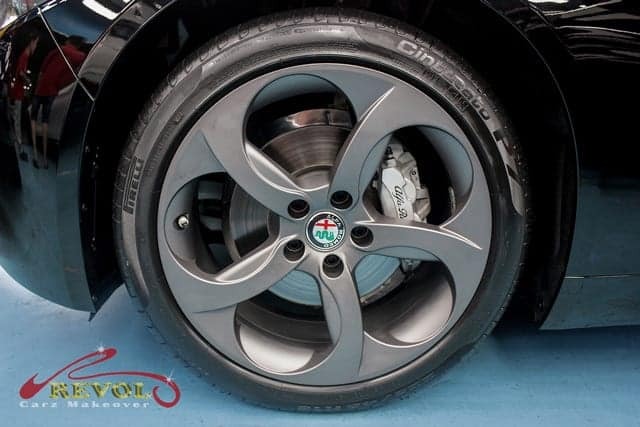 The Alfa Romeo Giulia Super comes equipped with unique design 18-inch sport alloy wheels shod in run flat tires. The wheels are all restored like showroom-new at Revol Carz Makeover. Express your distinction with the finest perfection in Revol car detailing and the ultimate ZeTough paint surface protection. Revol Carz Makeover is your preferred choice. Positive reviews by many of our satisfied customers say volumes of our proven reputation. We passionately believe that our proven, ZeTough Ceramic Paint Protection Coating gives you the most bang for your money because the ultimate mirror-shine doesn’t diminish and protects your paintwork for a longer time. You can see to believe, the Alfa Romeo Guila Super turns out even more stunning than its previous showroom condition after the Revol makeover. And it will remain shiny more permanently too. ZeTough Ceramic Paint Protection Coating makes the difference. The incredible long lasting protective coating promises a lifetime of paint protection. If the stunning outcome of the makeover has impressed you, your car too can enjoy the reliable, long lasting surface protection. You can count on our award-winning and proven, ZeTough Ceramic Paint Protection Coating. Yes, imagine what we can do for your car!